Listed in the National Register of Historic Places, Smith Memorial Hall nevertheless is no stodgy grande dame. In the 1920s it housed the fledgling music department’s classrooms, concert hall, and library. Now it contains studios and practice rooms for the keyboard (piano, accompanying, piano pedagogy, organ, and harpsichord), percussion, voice, and jazz divisions. Students build their skills in the up-to-the-minute digital piano lab and ensemble rehearsal facilities and in practice rooms with fine Steinway grand pianos. Organists and harpsichordists also have a choice of fine instruments for their practice. An 870-seat recital hall, with mahogany woodwork throughout, is a popular venue for student and faculty solo and ensemble performances; its three-manual Casavant concert organ adds a striking visual element to grand sound. But the jewel is Smith Memorial Room, a drawing-room reminiscent of European palaces with crystal chandeliers and exquisite décor—and an ideal location for chamber music and harpsichord recitals. 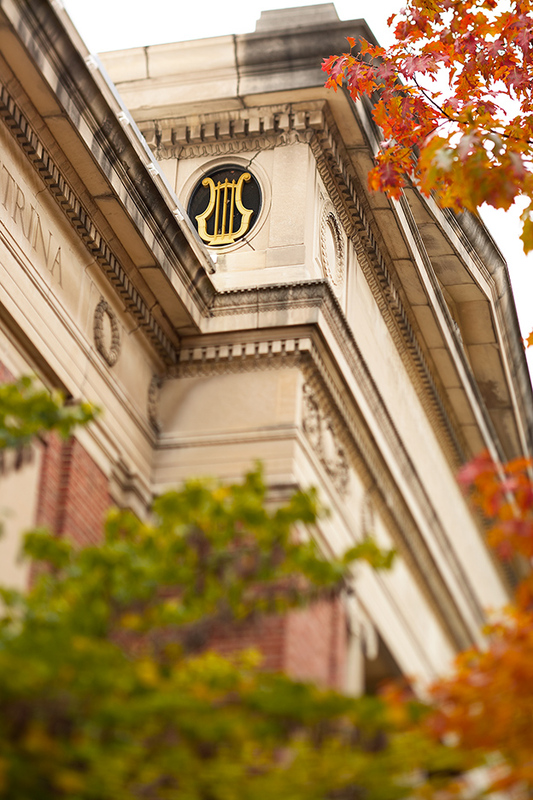 Smith Memorial Hall is open 7:00 a.m. to midnight when classes are in session.